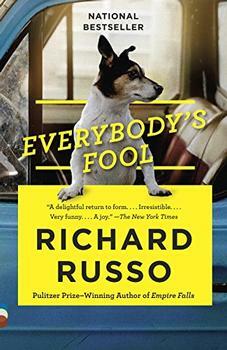 Following the best-selling Everybody's Fool, a new collection of short fiction that demonstrates that Richard Russo - winner of the Pulitzer Prize for Empire Falls - is also a master of this genre. Russo's characters in these four expansive stories bear little similarity to the blue-collar citizens we're familiar with from many of his novels. In "Horseman," a professor confronts a young plagiarist as well as her own weaknesses as the Thanksgiving holiday looms closer and closer: "And after that, who knew?" In "Intervention," a realtor facing an ominous medical prognosis finds himself in his father's shadow while he presses forward--or not. In "Voice," a semiretired academic is conned by his increasingly estranged brother into coming along on a group tour of the Venice Biennale, fleeing a mortifying incident with a traumatized student back in Massachusetts but encountering further complications in the maze of Venice. And in "Milton and Marcus," a lapsed novelist struggles with his wife's illness and tries to rekindle his screenwriting career, only to be stymied by the pratfalls of that trade when he's called to an aging, iconic star's mountaintop retreat in Wyoming. The information about Trajectory shown above was first featured in "The BookBrowse Review" - BookBrowse's online-magazine that keeps our members abreast of notable and high-profile books publishing in the coming weeks. In most cases, the reviews are necessarily limited to those that were available to us ahead of publication. If you are the publisher or author of this book and feel that the reviews shown do not properly reflect the range of media opinion now available, please send us a message with the mainstream media reviews that you would like to see added.